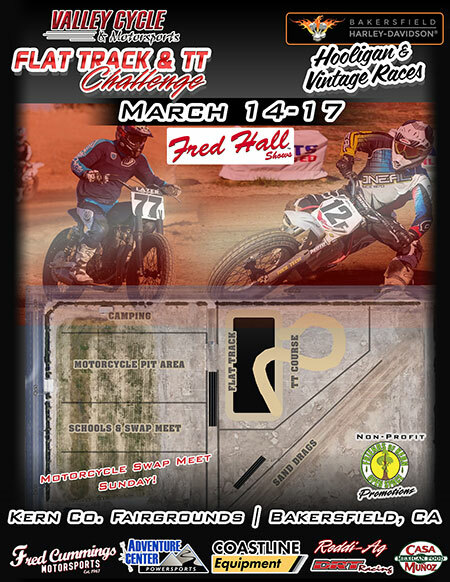 BAKERSFIELD, CALIFORNIA (February 1, 2019) – Dave Walker and Friends of Kern Open Space have announced the inaugural Flat Track & TT Challenge at The Fred Hall Shows Central Valley Sports show in Bakersfield. The event will run from March 14-17 with Flat Track & TT racing Friday, Saturday, and Sunday presented by Valley Cycle & Motorsports plus Hooligan and Vintage Racing on Sunday presented by Bakersfield Harley-Davidson. A swap meet on Sunday adds to the festivities along with camping all weekend. Admission will be $12 and includes admission to the Sports Show. Registration and scoring will be handled by DRT Racing, promoter of AMA Supermoto. Classes and registration details will be announced at a later date. Thanks to our sponsors: Fred Cummings Motorsports, Adventure Center Powersports, Coastline Equipment, Reddi-Ag, and Casa Munoz for their support.